Keeping your infrastructure operating at optimal levels is critical to meet and improve your uptime, as well as manage and optimize local and remote devices. 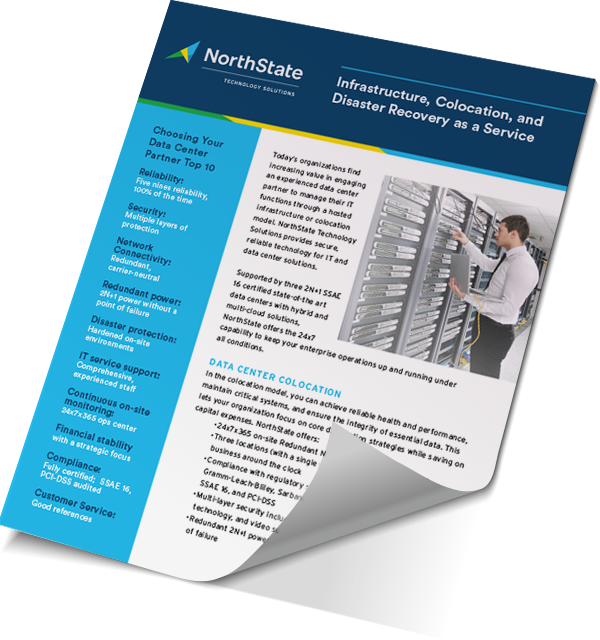 NorthState Technology Solutions creates dedicated IaaS (Infrastructure as a Service) solutions custom-engineered to your precise specifications. You get all the scalability and cost advantages of the cloud and the data center, while meeting your most rigorous security and compliance needs. Each of our dedicated infrastructure solutions is hosted in a highly secure, highly resilient, and fully compliant data center – supported around the clock by an onsite team of professionals.